Is a Hot Tub a Jacuzzi? Posted on January 25, 2019 January 25, 2019 , in Hot Tubs. If you have started your search for a hot tub online, you may have come across spas, hot tubs, Jacuzzi’s and so many other names, it may appear a bit confusing. Aren’t they are all just fancy names for tubs with hot water and massage jets? In the following article, we talk about what the difference is between a jacuzzi, spa, and hot tub. The look of hot tubs began to differ as well. It became popular to build spas out of molded fiberglass with thermoplastic shells. Shapes were also taken from the normal circle wooden barrel look to more rectangular or square options, allowing room for different numbers of people. When the manufacturers began marketing their units, they began using spa instead of hot tub. This has made the term interchangeable or meaning the same thing. What it primarily determines is preference. For some people, when they hear the word spa, they think a fancy day place filled with cucumber water and soothing music. Whereas, hot tub tends to make them think a more personal option for the backyard with massage and hydrotherapy options. The word jacuzzi is really just a brand name for a hot tub. The Jacuzzi brand was founded by two Italian brothers who created a pump that could be attached to a bathtub to create a whirlpool effect. Years after this invention, they began producing hot tubs which became world famous. The Jacuzzi became just as well known as ‘Scotch Tape’ or ‘Kleenex.’ The brand name was used to refer to the product. Sometimes people may be referring to a brand, but sometimes they may be referring to a hot tub and using the term incorrectly. Regardless of what you call your hot tub, it is primarily important you aim for a quality unit that from a trusted dealer and manufacturer. Any hot tub owner will tell you, there are plenty of great health and wellness benefits, but this can only be maximized when it is easy to clean, has minimal energy costs, and does not require frequent or costly maintenance. Three of the most important areas to look into when considering what hot tub is best for you include, jets, insulation, and warranty. Spa Jets – The number of jets is not nearly as important as the technology associated with the jets that will provide users with the best massage. 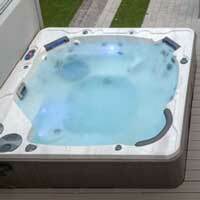 A hot tub with multiple styles of jets or customizable options may be your best bet. Having the ability to adjust direction, water pressure, and massage program can help ensure you are getting the best massage for your body. Insulation – The second important point is high-quality insulation. A well insulated hot tub will be both quieter and less expensive. This is due to their ability to trap heat produced by the motor, then reuse it to heat the water. Your water will then be at an ideal temperature for any time use. Warranty – A hot tub is a significant investment, so it is important to make sure you protect it. Be sure to ask many questions and confirm the model has an excellent warranty. A quality warranty will include the plumbing, shell, equipment, labor costs, and transportation. You now know spa and jacuzzi are interchangeable, making your online search a bit easier. You also know what important points to look for when buying your next hot tub. Consider downloading our hot tub buyer’s guide for more helpful information.